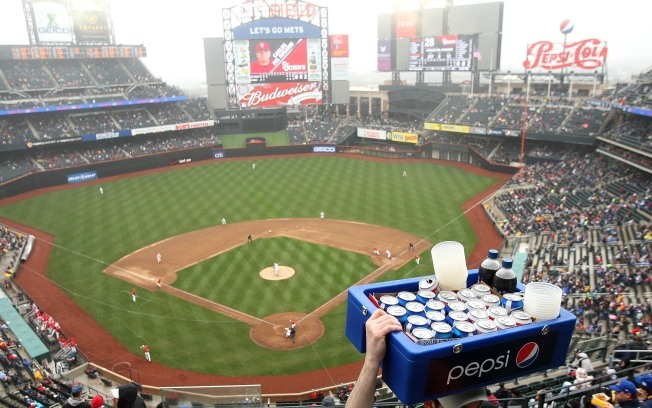 This weekend's game between Georgetown and St. John's gave fans a sneak peak of Citi Field. It seems both the Mets and Yankees are facing the embarrassing prospect of empty seats in the first few front rows of their shiny new stadiums on opening day. As the baseball blog Field of Schemes reports, the Mets have been basically spamming fans with offers for premium ($150-$200 — a few of the approximately 80 byzantine pricing levels) seats on opening day. At least the Shake Shack and Esca chef's outposts are looking good. And the Yankees don't seem to be doing much better airing TV and radio spots advertising seats, though at least all the nosebleeds have been snapped up. Of course, as we've all seen, New York baseball fans are not shy about jumping seats. So maybe the front offices don't have to worry about having those tasteful green seats at the house that Citibank built open. Leaving empty field level seats before the bleacher bums will be sort of like dangling a pound of yellowfin in front of a famished tiger.